Since 2014, several publications have emerged from our core reasarch and from the collaboration with our partners. "Environmental Transmission Electron Microscopy (ETEM) Studies of Single Iron Nanoparticle Carburization in Synthesis Gas"
Structural evolution of iron nanoparticles involving the formation and growth of iron carbide nuclei in the iron nanoparticle was directly visualized at the atomic level, using environmental transmission electron microscopy (TEM) under reactive conditions mimicking Fischer−Tropsch synthesis. Formation of the iron carbide nuclei and surface reconstruction of the iron nanoparticle play an essential role in carburization of the iron nanoparticle and consequent formation of Fe5C2. Identification of carbide and oxide intermediates evidenced by high-resolution TEM images, electron diffraction patterns and electron energy-loss spectra provides a detailed picture from initial activation to final degradation of iron under synthesis gas. "SiO2-supported Fe & FeMn colloids—Fischer-Tropsch synthesis on 3D model catalysts"
A well-defined model catalyst constituting a compromise between high surface area, porous, industrial catalysts and a planar model catalyst has been developed. It allows for measurements of catalytic activity in micro reactors, where diffusion problems are kept at a minimum, while characterization both by surface science techniques and by bulk techniques can be applied. Monodisperse, non-porous SiO2 microspheres with diameter 875 ± 25 nm have been synthesized, serving as the large area model support. These where then impregnated with pre-formed, monodisperse, colloidal Fe and FeMn nanoparticles resulting in a three-dimensional equivalent of a flat, Fe(-Mn)/SiO2 model catalysts. Characterization with electron microscopy (SEM and TEM), X-ray photoelectron spectroscopy (XPS) and X-ray diffraction (XRD), before and after catalytic testing was performed. It was shown that the model catalysts can be used in Fischer-Tropsch synthesis experiments under industrially relevant conditions. The FTS experiments reveal that compared to the pure Fe catalyst, FeMn shows more stable activity, higher selectivity towards olefins and lower selectivity toward CH4 and CO2. Significant amounts of hydrocarbons on the catalyst surfaces and some minor indications of sintering were detected after the reaction. Formation of FeCx was detected for the Fe catalyst while no significant amounts could be seen on the Mn-promoted catalyst. "Hydrogen from electrochemical reforming of C1–C3 alcohols using proton conducting membranes"
This study investigates the production of hydrogen from the electrochemical reforming of short-chain alcohols (methanol, ethanol, iso-propanol) and their mixtures. High surface gas diffusion Pt/C electrodes were interfaced to a Nafion polymeric membrane. 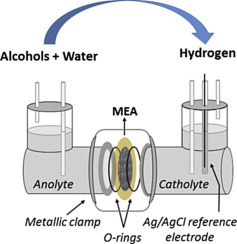 The assembly separated the two chambers of an electrochemical reactor, which were filled with anolyte (alcohol + H2O or alcohol + H2SO4) and catholyte (H2SO4) aqueous solutions. The half-reactions, which take place upon polarization, are the alcohol electrooxidation and the hydrogen evolution reaction at the anode and cathode, respectively. A standard Ag/AgCl reference electrode was introduced for monitoring the individual anodic and cathodic overpotentials. Our results show that roughly 75% of the total potential losses are due to sluggish kinetics of the alcohol electrooxidation reaction. Anodic overpotential becomes larger as the number of C-atoms in the alcohol increases, while a slight dependence on the pH was observed upon changing the acidity of the anolyte solution. In the case of alcohol mixtures, it is the largest alcohol that dictates the overall cell performance. "Ligand effects in rhodium-catalyzed hydroformylation with bisphosphines: steric or electronic?" Twelve commercially available bisphosphine ligands have been evaluated in rhodium-catalyzed hydroformylation reactions. All ligands exhibited high chemoselectivities for aldehyde formation. The highest enantioselectivity (53% ee) of styrene hydroformylation was achieved with (S)-BTFM-Garphos (L7) substituted with electron withdrawing substituents. High pressure NMR (HP-NMR) spectroscopy and in situ high pressure IR spectroscopy (HP-IR) were used to study the resting states of the catalyst species in the reactions. The ligand effect on the structures of the observable species was examined. Both electronic and steric factors were considered to contribute to the performance of the various ligands. The results showed that decreasing the phosphine basicity increased the enantioselectivity, while in the systems studied here the steric character plays a less important role than the electronic features in achieving good regioselectivities. "Understanding FTS selectivity: the crucial role of surface hydrogen"
Monomeric forms of carbon play a central role in the synthesis of long chain hydrocarbons via the Fischer–Tropsch synthesis (FTS). We explored the chemistry of C1Hxad species on the close-packed surface of cobalt. Our findings on this simple model catalyst highlight the important role of surface hydrogen and vacant sites for product selectivity. We furthermore find that COad affects hydrogen in multiple ways. It limits the adsorption capacity for Had, lowers its adsorption energy and inhibits dissociative H2 adsorption. We discuss how these findings, extrapolated to pressures and temperatures used in applied FTS, can provide insights into the correlation between partial pressure of reactants and product selectivity. By combining the C1Hx stability differences found in the present work with literature reports of the reactivity of C1Hx species measured by steady state isotope transient kinetic analysis, we aim to shed light on the nature of the atomic carbon reservoir found in these studies. "Adsorption and Decomposition of Ethene and Propene on Co(0001): The Surface Chemistry of Fischer–Tropsch Chain Growth Intermediates"
Experiments that provide insight into the elementary reaction steps of CxHy adsorbates are of crucial importance to better understand the chemistry of chain growth in Fischer–Tropsch synthesis (FTS). In the present study we use a combination of experimental and theoretical tools to explore the reactivity of C2Hx and C3Hx adsorbates derived from ethene and propene on the close-packed surface of cobalt. Adsorption studies show that both alkenes adsorb with a high sticking coefficient. Surface hydrogen does not affect the sticking coefficient but reduces the adsorption capacity of both ethene and propene by 50% and suppresses decomposition. On the other hand, even subsaturation quantities of COad strongly suppress alkene adsorption. Partial alkene dehydrogenation occurs at low surface temperature and predominantly yields acetylene and propyne. Ethylidyne and propylidyne can be formed as well, but only when the adsorbate coverage is high. Translated to FTS, the stable, hydrogen-lean adsorbates such as alkynes and alkylidynes will have long residence times on the surface and are therefore feasible intermediates for chain growth. The comparatively lower desorption barrier for propene relative to ethene can to a large extent be attributed to the higher stability of the molecule in the gas phase, where hyperconjugation of the double bond with σ bonds in the adjacent methyl group provides additional stability to propene. The higher desorption barrier for ethene can potentially contribute to the anomalously low C2Hx production rate that is typically observed in cobalt-catalyzed FTS. "Role of ZnO and CeOx in Cu-Based Model Catalysts in Activation of H2O and CO2 Dynamics Studied by in Situ Ultraviolet–Visible and X-ray Photoelectron Spectroscopy"
Flat model and powder Cu, ZnO/Cu, and CeOx/Cu catalysts were studied by focusing on the role of the oxide phase as a promoter in the water gas shift (WGS) and its reverse reaction (RWGS). Activity measurements of the powder catalysts showed that both oxides enhance Cu reactivity, with CeOx/Cu being more active than ZnO/Cu in the WGS reaction. 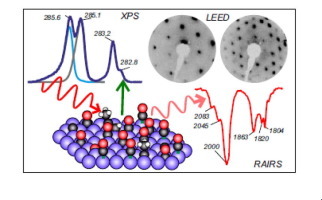 In situ ultraviolet–visible spectroscopy, exploiting the localized surface plasmon resonances of metallic Cu nanoparticles, together with X-ray photoelectron spectroscopy was then used to elucidate the origin of the enhanced reactivity on flat model catalysts. These experiments showed that ZnO and CeOx promote H2O and CO2 dissociation, leading to oxidation of the Cu nanoparticles. CeOx performs better in this respect than ZnO. This is important because the reactivity in the WGS and RWGS reactions is related to the ability to activate H2O and CO2. The Ce3+ ions are identified as the most efficient sites for H2O and CO2 dissociation, while Cu0 keeps Ce3+ stable by promoting reduction of Ce4+ during the dissociation process. In this sense, the CeOx/Cu catalyst forms a bifunctional catalyst, which is more active in the (R)WGS than CeOx and Cu catalysts separately. "Electrocatalysts for the generation of hydrogen, oxygen and synthesis gas"
Water electrolysis is the most promising method for efficient production of high purity hydrogen (and oxygen), while the required power input for the electrolysis process can be provided by renewable sources (e.g. solar or wind). The thus produced hydrogen can be used either directly as a fuel or as a reducing agent in chemical processes, such as in Fischer–Tropsch synthesis. 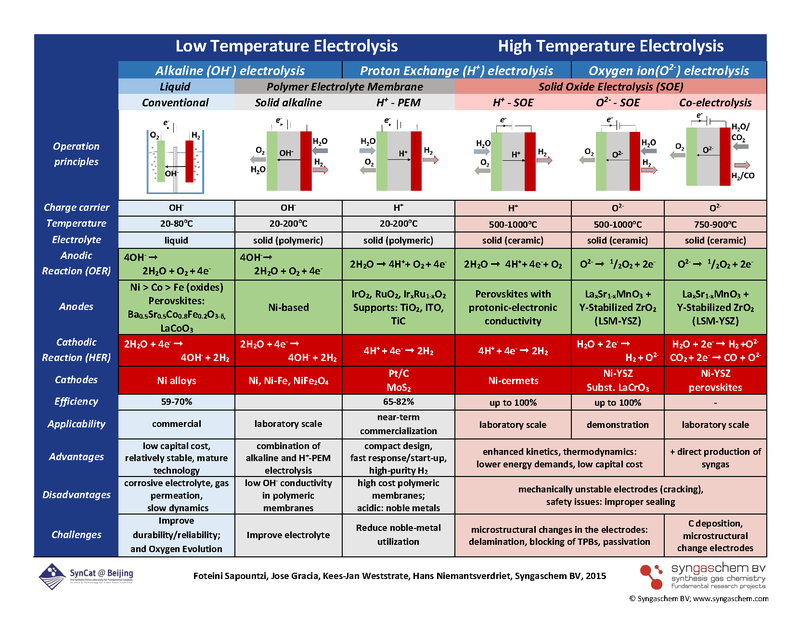 Water splitting can be realized both at low temperatures (typically below 100 °C) and at high temperatures (steam water electrolysis at 500–1000 °C), while different ionic agents can be electrochemically transferred during the electrolysis process (OH−, H+, O2−). Singular requirements apply in each of the electrolysis technologies (alkaline, polymer electrolyte membrane and solid oxide electrolysis) for ensuring high electrocatalytic activity and long-term stability. The aim of the present article is to provide a brief overview on the effect of the nature and structure of the catalyst–electrode materials on the electrolyzer's performance. Past findings and recent progress in the development of efficient anode and cathode materials appropriate for large-scale water electrolysis are presented. The current trends, limitations and perspectives for future developments are summarized for the diverse electrolysis technologies of water splitting, while the case of CO2/H2O co-electrolysis (for synthesis gas production) is also discussed. "Spectroscopic insights into cobalt-catalyzed Fischer-Tropsch synthesis: A review of the carbon monoxide interaction with single crystalline surfaces of cobalt"
The present article summarizes experimental findings of the interaction of CO with single crystal surfaces of cobalt. We first provide a quantitative study of non-dissociative CO adsorption on Co(0001) and establish a quantitative correlation between θCO and adsorption site occupation. In light of these findings we revisit the structure of previously reported ordered CO/Co(0001) adsorbate layers. Measurements of the CO coverage at equilibrium conditions are used to derive a phase diagram for CO on Co(0001). For low temperature Fischer-Tropsch synthesis conditions the CO coverage is predicted to be ≈0.5 ML, a value that hardly changes with pCO. The CO desorption temperature found in temperature programmed desorption is practically structure-independent, despite structure-dependent heats of adsorption reported in the literature. This mismatch is attributed to a structure-dependent pre-exponential factor for desorption. IR spectra reported throughout this study provide a reference point for IR studies on cobalt catalysts. 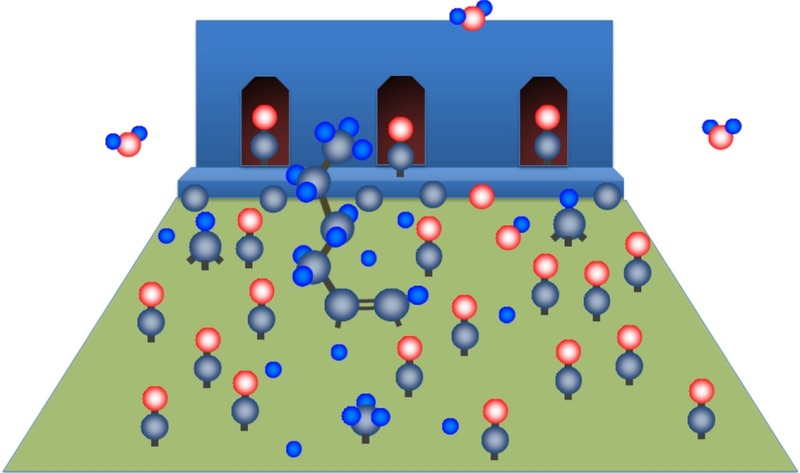 Results for CO adsorbed on flat and defect-rich Co surfaces as well as particular, CO adsorbed on top sites, and in addition affect the distribution of COad over the various possible adsorption sites. "Reflections on the Fischer-Tropsch synthesis: Mechanistic issues from a surface science perspective"
The current paper presents a mechanistic view on important steps in the Fischer-Tropsch synthesis on cobalt catalysts, inspired by surface science studies. By revisiting the relation between activity and selectivity that results from the ASF assumption we highlight that knowledge about the number of growing chains as well as their residence time (∼growth rate) is of crucial importance to sketch a physically realistic scenario for FTS. This motivates further investigations into the microscopic scenario for FTS chain growth on fcc cobalt nanoparticles, by looking into the reaction mechanism in relation to surface structure and by determining the activation energies for key elementary steps. Such studies indicate that the modest activity of Co FTS catalysts might very well be attributable to the difficulty to remove chemisorbed oxygen from the metallic surface, rather than to dissociation of CO, which was found to proceed readily at step edge sites. Chain growth is envisaged to take place on the close-packed surfaces, with chain initiation via CH + CH to form acetylene, followed by hydrogenation to form ethylidyne, C-CH3, a reaction that is shown to be promoted by co-adsorbed CO. Ethylidyne then couples with CH to form propyne, HC-C-CH3, etc. We propose that a fairly large number of surface sites is involved in the growth of a single chain. In such a “growth ensemble” multiple active step sites produce CHx monomer species that spill over onto the same close-packed coupling terrace, where one or only a few chains grow at the same time. In such a scenario diffusion of hydrocarbonaceous surface species is an essential step in the overall reaction sequence. We explore which factors need to be taken into account when considering of CxHy species under realistic reaction conditions. In addition, we note that the coupling reaction itself, via CH + C-CnH2n+1, is a source of growing chain mobility. "Properties of Manganese(III) Ferrocenyl-β-Diketonato Complexes Revealed by Charge Transfer and Multiplet Splitting in the Mn 2p and Fe 2p X-Ray Photoelectron Envelopes"
A series of ferrocenyl-functionalized β-diketonato manganese(III) complexes, [Mn(FcCOCHCOR)3] with R = CF3, CH3, Ph (phenyl) and Fc (ferrocenyl) was subjected to a systematic XPS study of the Mn 2p3/2 and Fe 2p3/2 core-level photoelectron lines and their satellite structures. A charge-transfer process from the β-diketonato ligand to the Mn(III) metal center is responsible for the prominent shake-up satellite peaks of the Mn 2p photoelectron lines and the shake-down satellite peaks of the Fe 2p photoelectron lines. Multiplet splitting simulations of the photoelectron lines of the Mn(III) center of [Mn(FcCOCHCOR)3] resemble the calculated Mn 2p3/2 envelope of Mn3+ ions well, indicating the Mn(III) centers are in the high spin state. 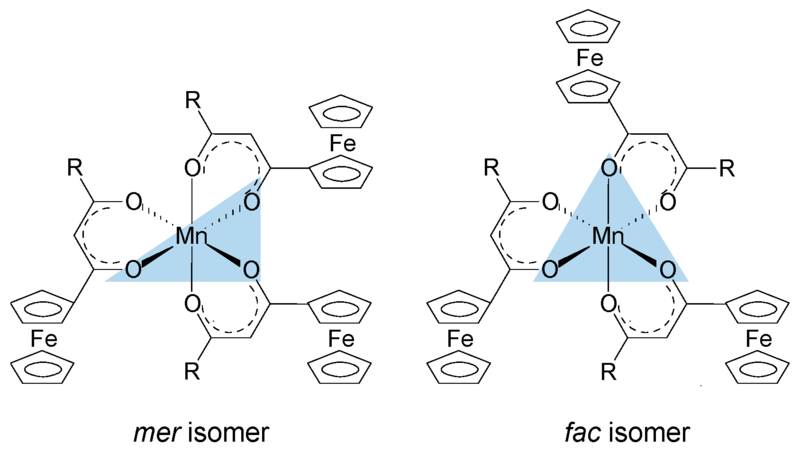 XPS spectra of complexes with unsymmetrical β-diketonato ligands (i.e., R not Fc) were described with two sets of multiplet splitting peaks representing fac and the more stable mer isomers respectively. Stronger electron-donating ligands stabilize fac more than mer isomers. The sum of group electronegativities, ΣχR, of the β-diketonato pendant side groups influences the binding energies of the multiplet splitting and charge transfer peaks in both Mn and Fe 2p3/2 photoelectron lines, the ratio of satellite to main peak intensities, and the degree of covalence of the Mn–O bond. "Consequences of Electron-Density Manipulations on the X-ray Photoelectron Spectroscopic Properties of Ferrocenyl-β-diketonato Complexes of Manganese(III). Structure of [Mn(FcCOCHCOCH3)3]"
Novel manganese(III)−ferrocenyl complexes of the type [Mn(FcCOCHCOR)3] have been synthesized, and the single-crystal structure of [Mn(FcCOCHCOCH3)3] was determined. X-ray photoelectron spectroscopy-determined binding energies of Fe(II) and Mn(III) in these complexes, and of Fe(II) in the free β-diketones, were found to relate linearly with the group electronegativities of each R group. This allows easy empirical prediction of Fe(II) and Mn(III) binding energies in these systems. "Cu Model Catalyst Dynamics and CO Oxidation Kinetics Studied by Simultaneous in Situ UV–Vis and Mass Spectroscopy"
The oxidation state of Cu nanoparticles during CO oxidation in CO + O2 gas mixtures was sensitively monitored via localized surface plasmon resonances. 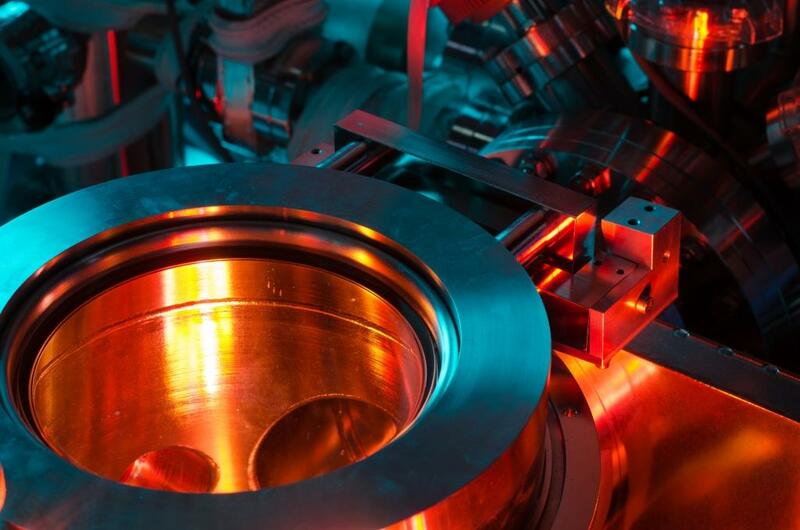 A microreactor, equipped with in situ UV–vis and mass spectrometry, was developed and used for the measurements. Cu nanoparticles of ∼30 nm average diameter were supported on optically transparent, planar quartz wafers. The aim of the study is 2-fold: (i) to demonstrate the performance and usefulness of the setup and (ii) to use the combined strength of model catalysts and in situ measurements to investigate the correlation between the catalyst oxidation state and its reactivity. Metallic Cu is significantly more active than both Cu(I) and Cu(II) oxides. The metallic Cu phase is only maintained under conditions where close to full oxygen conversion is achieved. This implies that kinetic measurements, aimed at determining the apparent activation energy for metallic Cu under realistic steady-state conditions, are difficult or impossible to perform. "Methane, formaldehyde and methanol formation pathways from carbon monoxide and hydrogen on the (0 0 1) surface of the iron carbide χ-Fe5C2"
Formation of CHx(O) monomers and C1 products (CH4, CH2O, and CH3OH) on C-terminated χ-Fe5C2(0 0 1) (Hägg carbide) surfaces of different carbon contents was investigated using periodic DFT simulations. 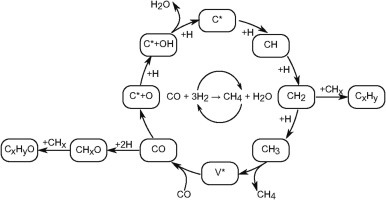 Methane (CH4) as well as monomer (CHx) formation follows a Mars–van Krevelen-like cycle starting with the hydrogenation of surface carbidic carbon, which is regenerated by subsequent CO dissociation, while oxygen is removed as H2O. In cases where surface carbon is readily available, the apparent barrier for CH4 formation was found to be ∼95 kJ/mol. However, different rate-determining steps show that different propagation mechanisms may be possible for actual chain growth, depending on the carbon content of the surface. Hydrogen addition to CO forms formyl (HCO), which is a precursor for both H-assisted CO activation and oxygenate formation. Further hydrogenation of HCO yields adsorbed formaldehyde and methoxy, rather than hydroxymethyl (HCOH) that would give C–O bond splitting. Full hydrogenation to gas-phase methanol faces a high barrier, suggesting that CHxO species may be involved in higher oxygenate formation in a full Fischer–Tropsch mechanism or that the C–O bond does not break until the CHO fragment has been incorporated in a C2 species, a route for which precedents are available in the literature. CO and H2 (co-)adsorption, direct and H-assisted CO activation, and surface carbon hydrogenation were investigated on C-terminated χ-Fe5C2(0 0 1) surfaces. Periodic DFT simulations at different surface carbon contents on the carbide surface showed that CO adsorbs preferably linearly on Fe top sites; CO and H2 adsorptions being stable. The perfect carbide surface favors carbidic carbon hydrogenation (i.e. CH formation), whereas carbon-free surface favors direct CO dissociation and restoration of the carbide structure. In partially carbon-vacant intermediate situations, both direct and H-assisted CO activations are energetically feasible, the latter being the preferred path. 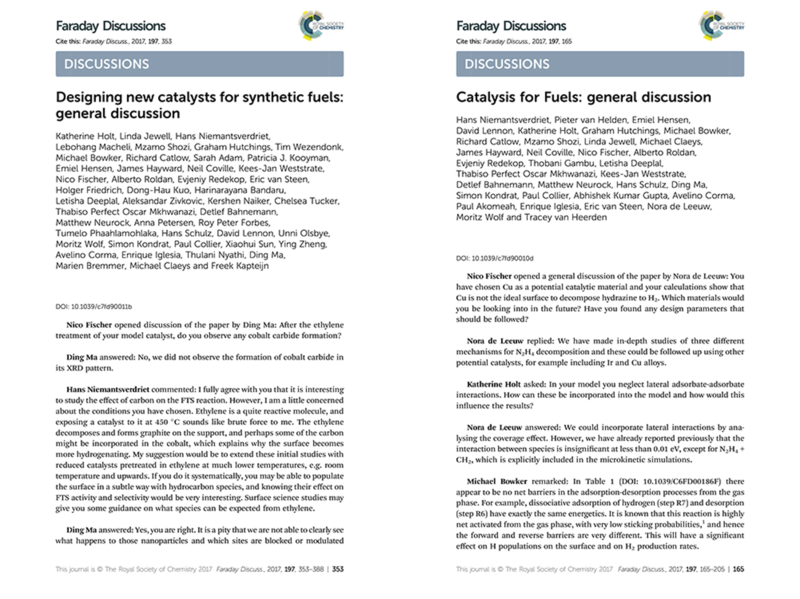 Considering CHx and CHxO species as initiators for different product types can explain the catalytic behavior and selectivity patterns of iron carbide catalysts. 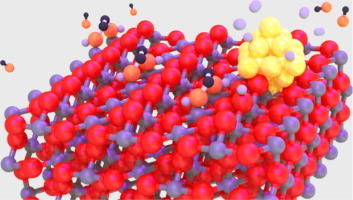 The catalytically active surfaces are concluded to be dynamic, where carbon atoms of the carbide surface participate in the surface reactions, and CO dissociation on vacant sites leads to restoration of the carbide structure. "Photocatalytic C-C bond cleavage in ethylene glycol on TiO2: A molecular level picture and the effect of metal nanoparticles"
Polyol conversion to value-added products is of great interest for the bio-diesel industry. Photocatalytic oxidation processes may offer a green approach for polyol conversion; however the lack of comprehensive mechanistic understanding from an interdisciplinary perspective limits or even misleads the design of highly selective and efficient photocatalysts for such process. Here we have studied the photocatalytic polyol conversion on pristine TiO2 and metal (Au, Pd, and Pt) nanoparticles (NPs) decorated TiO2 using ethylene glycol (EG) as the model compound. We have developed a mechanistic picture at molecular level by coupling in-situ surface science study on rutile (110) surface with in-situ vibrational-mass spectrometry study on TiO2 nanopowders. The C-C bond cleavage was found to be the only pathway in EG photo-conversion under deaerated conditions, leading to the formation of formaldehyde and hydrogen. We rationalized that the desorption of the surface adsorbed H (Hads) to be the rate determining step (RDS), making pristine TiO2 a poor photocatalyst that only catalyze the EG conversion at very low surface coverages. The addition of metal NPs on TiO2 surface promotes the desorption of Hads significantly, thus leading to an enhanced C-C bond cleavage performance at higher surface coverages that is more applicable. "Oxygen Evolution Reaction on Perovskite Electrocatalysts with Localized Spins and Orbital Rotation Symmetry"
We have studied, by using ab initio calculations, the electronic properties of electro-catalysts for the oxygen evolution reaction (OER) with polarised density of states caused by localised spins in the d shell. Oxygen is a molecule in the triplet state (i.e. the outer electrons have parallel spins), which means that the spins localised in the p shell (↑O=O↑), the d shell and the conduction band electrons (t2gnegm) will couple through exchange interactions, which we think will provide favourable conditions for the OER. 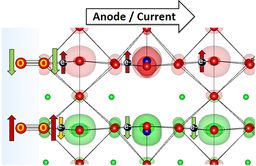 We compare the perovskites CaCu3Fe4O12 (CCF) and Ba0.5Sr0.5Co0.8Fe0.2O3−δ (BSCF) with RuO2. CCF and BSCF both have fluctuating electronic structures accessible at room temperature that are linked to conducting spin-polarised density of states, equivalent to the paramagnetic state of covalent transition metal oxides with fine charge conductivity. 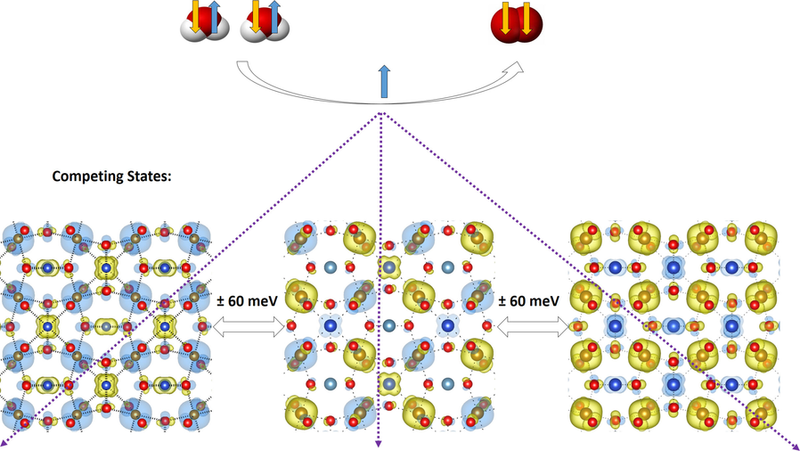 CCF and BSCF both possess a considerable number of unpaired electrons localised in the inner d shell, high-spin configurations and competing inter-atomic exchange interactions. As a first approximation, the average fluctuation of the magnetisation in the metal atoms correlates linearly with the OER onset potential for the studied compositions. By linking the dynamics of the localised inner-electron spins to the conduction spins through exchange interactions, we can predict that other perovskites, such as Sr2Fe0.75Co0.25MoO6, will be OER active at room temperature, as they have similar electronic properties to CCF and BSCF. "Layered Antiferromagnetic Ordering in the Most Active Perovskite Catalysts for the Oxygen Evolution Reaction"
We have performed an in-depth ab initio study of the magnetic structure within the most active perovskites for the oxygen evolution reaction. In all cases, the ground state exhibits an extended antiferromagnetic coupling in the unit cell. Layered antiparallel alignment of the magnetic moments appears to be related to their electrocatalytic activity. All the perovskites calculated within this paper show space-separated charge-transport channels depending on the spin orientation. Comparing the electronic structures with the reported activities, we find a direct correlation between the magnetic accumulation on the spin channels in the bulk material and the catalytic activity. We discuss the possible implications of such observations in terms of magnetic interactions. During oxygen evolution in water electrolysis, reactants and products do not preserve spin. For triplet state oxygen to evolve, the catalyst at the anode can speed up the reaction if it is able to balance the magnetism of the oxygen molecule by extracting electrons with an opposite magnetic moment, conserving the overall spin. "Mechanistic Insight into the Interaction Between a Titanium Dioxide Photocatalyst and Pd Co-catalyst for Improved Photocatalytic Performance"
Understanding the co-catalyst/semiconductor interaction is of key importance for the design and synthesis of next generation photocatalytic materials for efficient hydrogen production and environmental clean-up applications. Here we investigate preformed Pd nanoparticles (NPs) supported on a series of anatase TiO2 having well-controlled but varying degrees of crystallinity and crystallite size, and explore their photocatalytic performance for H2 production and phenol decomposition. Whilst tuning the anatase crystallite size significantly influences the photocatalytic performance, varying the TiO2 crystallinity shows a negligible effect. Interestingly, the optimum quantum efficiency (~78%) for H2 evolution is achieved with anatase having medium crystallite size (~16 nm), whereas for phenol decomposition, a promotional effect is only observed for anatase with larger crystallite sizes (> 20 nm). Surface radical species and radical densities study reveal that the photogenerated charge carriers have been trapped at different sites depending on the crystallite size of anatase. Whilst the excited electrons are only trapped in bulk lattice sites in small anatase (<16 nm), larger anatase particles provide extra surface sites for charge trapping, which benefit charge storage and transportation to Pd surface sites, leading to a more efficient utilisation of charge carriers for photocatalysis. Additionally, Pd supported on medium-size anatase (~16 nm) hinders the formation of O2•- radicals on TiO2 surfaces, thus preventing unwanted re-oxidation of photogenerated H2. Editor’s choice = open access! Using scanning tunneling microscopy (STM), we characterize the atomic-scale details of ultrathin films of iron carbide (FexCy) on Au(111) synthesized as a potential model system for the active iron carbide phase in iron Fischer–Tropsch synthesis (FTS) catalysts. The experiments show that room-temperature exposure of Fe islands gas to C2H4 deposited on the clean Au(111) surface results in partly converted Fe/FexCy islands. Multistep flash-heating treatment of the partly converted Fe/FexCy islands at 523 and 773 K results in pure highly crystalline FexCy islands with in-plane nearest-neighbor distances of 0.315 ± 0.005 nm. On the basis of the atom-resolved STM data, we propose that C2H4 dissociates at Fe island edges, after which the carbon diffuses inward into the interstitial region between the Fe and the Au substrate to form an FexCy surface that may be a good starting point for the investigation of iron carbide surfaces present under FTS conditions. "Activation pathways taking place at molecular copper precatalysts for the oxygen evolution reaction"
"Detangling Catalyst Modification Reactions from the Oxygen Evolution Reaction by Online Mass Spectrometry"
"The effect of C–OH functionality on the surface chemistry of biomass-derived molecules: ethanol chemistry on Rh(100)"
"Modeling the surface chemistry of biomass model compounds on oxygen-covered Rh(100)"
"Hydrogen spillover in the Fischer–Tropsch synthesis: An analysis of gold as a promoter for cobalt–alumina catalysts"
"Hydrogen spillover in the Fischer–Tropsch synthesis: An analysis of platinum as a promoter for cobalt–alumina catalysts"
"Hydrophilic Interaction Between Low-Coordinated Au and Water: H2O/Au(310) Studied with TPD and XPS"
"Elementary steps in Fischer–Tropsch synthesis: CO bond scission, CO oxidation and surface carbiding on Co(0001)"
"Oxygen Adsorption and Water Formation on Co(0001)"
"Ammonia Adsorption and Decomposition on Co(0001) in Relation to Fischer–Tropsch Synthesis"
"Nano-heaters: New insights on the outstanding deposition of dielectric energy on perovskite nanoparticles"
"Modeling the Surface Chemistry of Sugars: Glycolaldehyde on Rhodium (100)"
"Catalysis & Future Electricity Technology: What’s the Connection? " "CO as an active spectator species in hydrocarbon conversions related to Fischer-Tropsch synthesis"
"Ultrahigh vacuum studies of the Fischer-Tropsch synthesis reaction"
"Syngas and Fischer-Tropsch Synthesis for Energy-Dense Liquid-Fuel Production in Energy Technology"
"Syngas as Essential Ingredient of Electricity Storage Technology: Electrolysis and Fischer-Tropsch Synthesis"
"Why Fischer-Tropsch synthesis needs carbon monoxide: the role of CO in the FTS chain growth mechanism"
"Hydrocarbon chemistry on cobalt: surface science investigations of the FT chain growth mechanism"
"Surface science investigations of the Fischer-Tropsch reaction on cobalt"
"Fischer Tropsch Synthesis in CTL and GTL technology"
"Reflections on Fischer Tropsch synthesis mechanisms and catalytic sites concepts"
"Heterogeneous Catalysis: Design and Characterization"
"Fischer-Tropsch synthesis in coal-to-liquids: Old technology with a bright future?" Hans Niemantsverdriet, Workshop on Nanoparticles in Reactive Environment, Marseille, France, Jan 27-29, 2014. "Hydrogen production from short-chain alcohols using polymeric proton conductors"
© 2012 - 2014 Syngaschem B.V. All right reserved.